One might well argue that opera is dead, given the lifeless new operas that lately have premièred to much fanfare and subsequent disappointment. I am happy to report that Osvaldo Golijov's Ainadamar is very much alive, and definitely kicking, to strain a cliché. Golijov, the son of Israeli parents, was brought up in Argentina, and his music has combined Latin American, Spanish, Yiddish, Arabic, and North American influences… not always coherently. Here, the mix is perfect, and if this CD doesn't make new friends for Golijov, then there's no justice in the world. The title is the Arabic name for the "fountain of tears," a famous well in Granada where poet Federico García Lorca and other perceived revolutionaries were shot by Fascist Falangist forces in 1936. The story of Lorca's arrest and execution – his "passion," if you will – is framed by episodes three decades later involving his friend since childhood, the Catalan actress Margarita Xirgu. Now approaching her own death, as she waits offstage to perform in a play Lorca had written for her, she agonizes over her failure to save his life. In the final portion of Ainadamar, a vision of Lorca appears to comfort her, telling her that his words will live on through her work, and the work of her students. Margarita dies, but her voice goes on, singing, "I am freedom, I am the source, the fountain from which you drink." The opera's 2003 première revealed structural problems, and what is heard here is a revised version in which the composer, librettist David Henry Hwang, and Peter Sellars all participated. 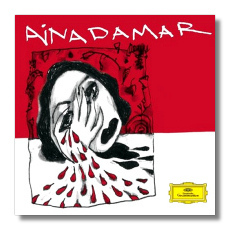 Not having heard the original, or seen any productions of Ainadamar on stage, I can't legitimately make comparisons, but I can say that this is opera is so dramatically and musically vivid that I don't miss not being able to see it. (Not that I wouldn't like to!) Golijov's earlier works demonstrated his aptitude for the theatrical, and here, that aptitude has found a nearly perfect receptacle. Popular music, pure flamenco (none of that "flamenco nuevo," thank you! ), and let's-pull-out-all-the-stops opera come together electrifyingly to tell the story of the Christ-like Lorca and Margarita, his personal Mary Magdalene. Unafraid of technology, Golijov introduces effects such as distorted political speeches and a "Gunshot Interlude." (You might want to warn the neighbors!) The ensemble includes Jeremy Flower and his "laptop, sound design and processing." However, Ainadamar is at its most beautiful and memorable when Golijov is evoking the spirits of Mozart and Richard Strauss, just as Margarita evoked Lorca's own spirit. Golijov's writing for female voices is so beautiful one fears it might be outlawed, particularly in the trio for Lorca, Margarita, and her student Nuria. Der Rosenkavalier, Act Three, anyone? O'Connor and Rivera give stellar performances here, but it is Upshaw who leaves one breathless with the intelligence and beauty of her singing. Contemporary classical music for voice has no greater friend than this daring, fearsomely accomplished soprano. Admiration also is due to flamenco singer Jesús Montoya, who (ironically) sings in true cante jondo style the role of the Falangist officer who arrests Lorca. The women of the Atlanta Symphony Orchestra Chorus sound like the best Broadway ensemble ever, and Spano's orchestra (aided by electronics and a small Andalusian-style ensemble) like the best pit band. The engineering creates a vivid theater of the mind, and DG's booklet contains not just texts and translations, but also helpful notes by music critic Alex Ross and director Peter Sellars. Don't be a stick in the mud: Ainadamar is the best "show" in town!